(Bond, CO) Ticket sales for the fifth annual YarmonyGrass Festival are now underway. The high country camping event known for unrivaled mountain activities and top shelf national talent will take place in Bond, CO on August 20-22nd offering concert goers an experience that is as good for the soul as it is for the ears. 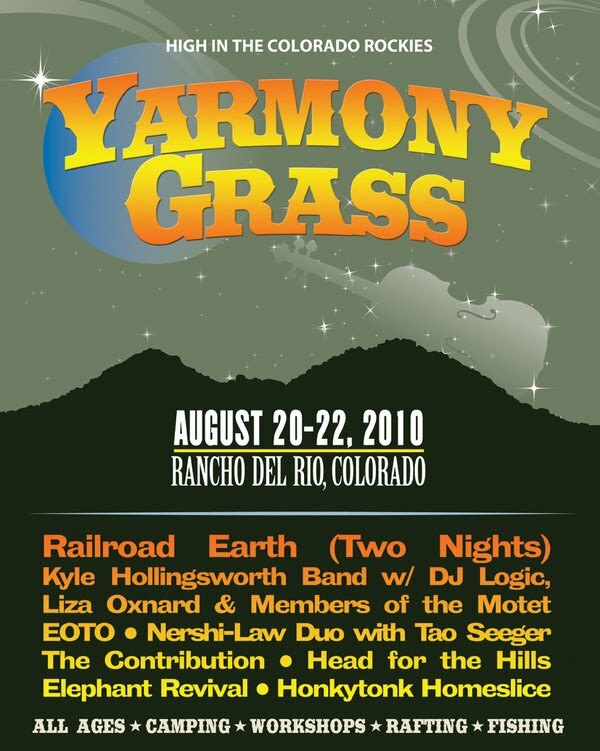 2010 marks the five-year anniversary for the YarmonyGrass Festival – an intimate two-day camping event slated for late summer in the Colorado Rockies. In just a few short years the event has grown from a word of mouth gathering into a full-fledged festival specializing in all the activities the Colorado Rockies has to offer. YarmonyGrass features an array of musical flavors including a two-night stand with the six-piece Americana outfit, Railroad Earth. Long time veterans of YarmonyGrass, Railroad Earth has built incredible steam over the past few years with notable performances on some of the most prestigious stages in the country, including Red Rocks, Bonnaroo, Austin City Limits Festival, Telluride Bluegrass, Rothbury, 10,000 Lakes, and many more. Other notables include Bill Nershi (String Cheese Incident) performing with guitarist Scott Law and Tao Seeger, as well as Head for the Hills, Elephant Revival, EOTO, The Contribution and Kyle Hollingsworth Band – performing with DJ Logic and members of the Motet. Don’t miss this intimate event taking place this August outside of Vail in Bond, CO. Bring your family, bring your friends and don’t forget to bring your bathing suit for the only live music and camping event in the Rockies where the outdoorsmen and music lover unite.